I came across this great post by Anna Vital and thought it was too good not to share. I want to share an elegant trick where a “viral loop” on LinkedIn got me over 76,000 email subscribers in just one month. I use the SEO software Ahrefs to support my clients in getting found online. I typically go to Ahrefs blog mostly for SEO insights, advice, and studies. And there’s no doubt that good SEO will create a steady, passive stream of visitors to your website. But it can take quite a while to get good results. A recent study here at Ahrefs has shown that almost 95% of newly published pages don’t get to the Top10 within a year. That’s why when you’re bootstrapping your startup you need to start working on your website’s SEO as soon as possible. Hence you need a kind of marketing move that can start bringing you customers right away. I am going to show you a simple trick that got me 76k+ email subscribers in less than a month. You may have seen better, but for me that was a tremendous success! To get these results, I started a “viral loop” on LinkedIn where I played the curiosity card. Let me show you exactly how to do that. 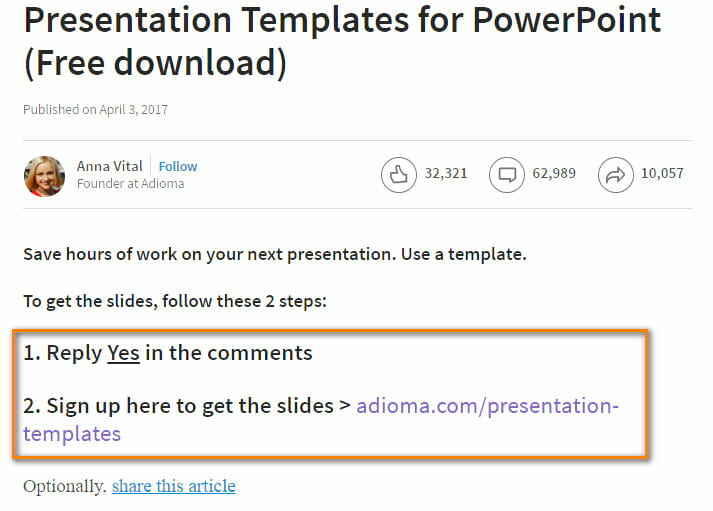 One day, as I was checking my LinkedIn feed, I saw that one of my connections had commented “Yes” on some post with free presentation slides. I opened the post and saw thousands of other people writing the same comment: “Yes”. Naturally I wanted to figure out what was going on there. They were giving out something free yet valuable in their post. One also had to comment “Yes” on a post to get that freebie. The latter was a gamechanger. 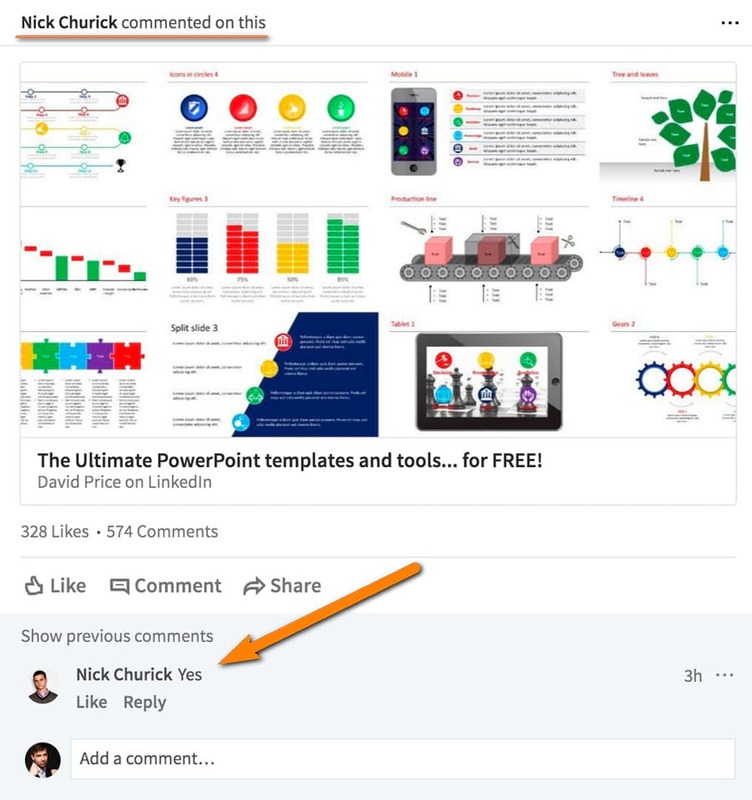 By adding this simple comment, people were spreading this post like hell in front of their own LinkedIn connections, bringing more and more people to it and dragging them into a viral loop. This whole concept hang upon people’s curiosity. And it worked like a charm! As more and more people saw the article and got a freebie, a viral loop was born. And the author’s email list was growing like hell. Seeing what they did, I created my own presentation templates to give away and ran a similar campaign. Now let me share the exact steps I took to imply a similar strategy to drastically grow my email list. No matter what tricks and hacks you’re using to bring people to your post, you must offer something really valuable in it. In my case, it was a set of templates for PowerPoint. 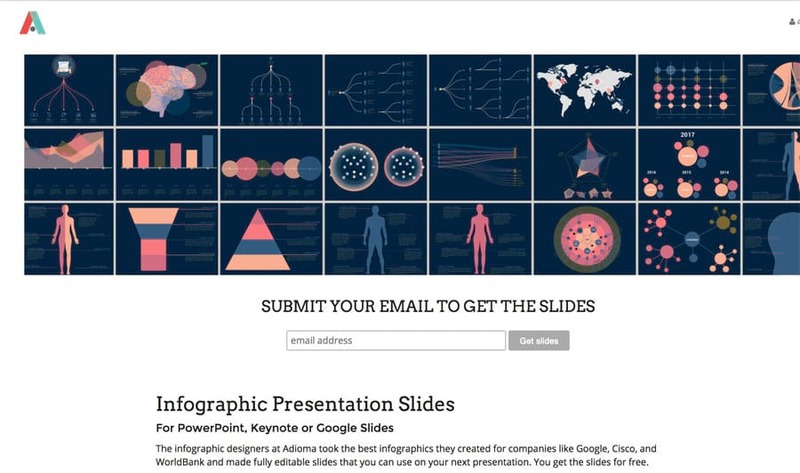 The templates were easily editable and could be a perfect basis for any presentation. People love such stuff. But you are not limited to presentations here. Other examples I have seen include email templates, marketing checklists or even discounts — anything people in your niche find valuable and would like to get. Explain why people need your freebie and what exactly they will get in your LinkedIn article. Give your article a headline explaining what freebie you’ll be giving out. People should instantly understand its value. 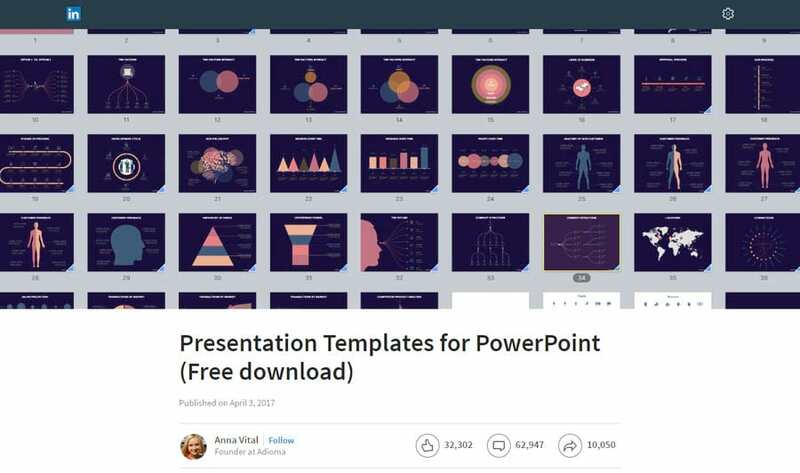 I used the word “PowerPoint” in the title as I anticipated people knew exactly what PowerPoint was and how easy it would be to use my presentation templates. This item is very important. 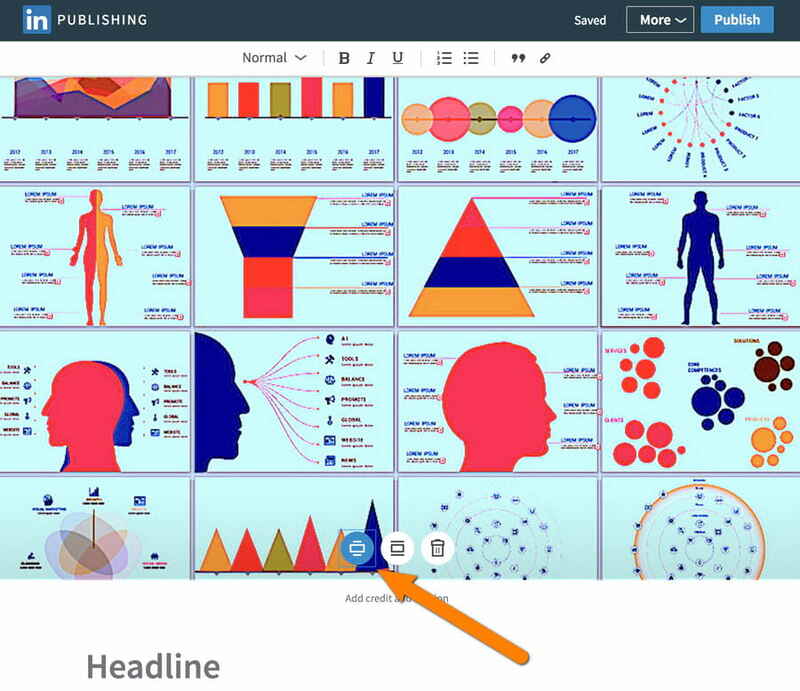 The image in a header will be shown in the LinkedIn feeds as you post will be going viral. Make sure you’ve used 2:1 aspect ratio. It is the best fit for LinkedIn. Now this header and title will show up in the feeds of your connections. As people will comment on your post, it will appear in the feeds of their connections as well. 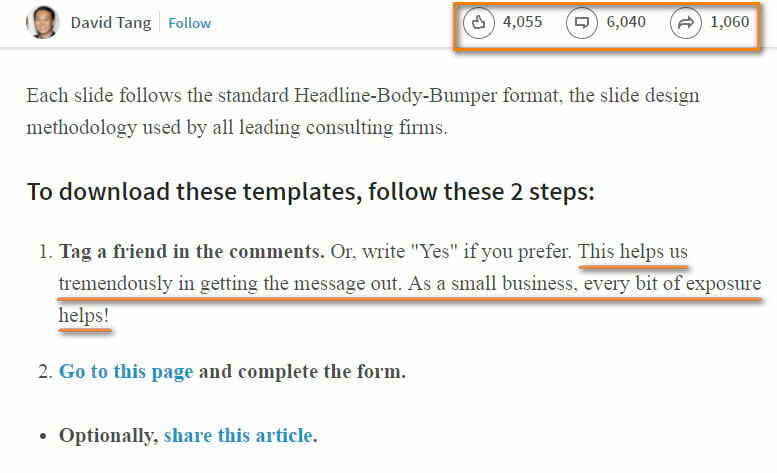 In your article, you need to outline some simple rules to follow in order to get a freebie. Pretty straight to the point. You can add such an instruction to any place (or even places) of your post, where it will be instantly visible. Now attention here! The first part of this thesis instruction is what makes this post potentially go viral. This is where you ask people to comment on the post. As you understand, people can download the freebie without commenting or sharing the post. However, since you are giving something away for free, you have a right to ask for something in exchange. It’s up to you to decide how pushy you want to be. Writing things like “Comment ‘Yes’ to be whitelisted” may increase the number of comments, but that would be a bold manipulation. This may also backfire by scaring away commenters who are averse to such tricks. The 3 obvious options for what you might ask are likes, comments, and shares. All of them will appear in the LinkedIn feeds. However, comments are the most interesting. Commenting takes more effort than clicking the like button, but you’re just asking to write 3 letters “Yes.” That’s really easy. This will start a chain reaction of “Yes what?” on LinkedIn. And that’s exactly what you need! Although a like or share are good options as well. As we’re setting sights on email subscribers as leads, your instruction must also contain a link to a page with an opt-in form. The easiest way to get a landing page with an opt-in form on it is to use LeadPages service. As a startup may not be ready to invest into a paid tool. So you can easily use Constant Contact’s Form Builder. It’s free before you get 2,000 subscribers. And if you have a WordPress powered website, there is a bunch of plugins that can help you with that. This makes the subscription process faster and easier. I recommend you to use a “double opt-in” route for your new subscribers and send them an email with a confirmation link. This will decrease the number of signups but increase the quality of emails, sifting out the fakes. Once they click the link to confirm their email address, you will deliver them their freebie. Make sure the files you are sending are not too large. Put them into a single .zip folder if there are more than one. 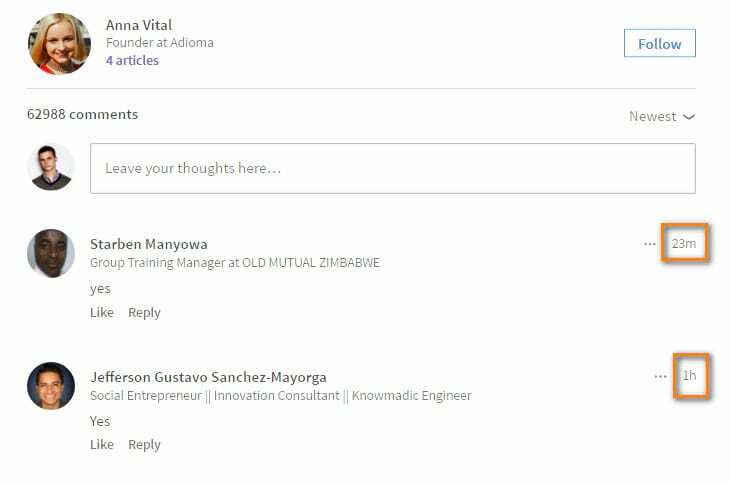 An article on LinkedIn will be visible to all your connections and followers. Before you publish it, make sure that you set the header image to wide mode. That’s all for the setup. Now, once I launched the campaign, I didn’t sit back and wait for the comments to start pouring in. To get the viral effect, you need at least 1,000 comments. 1. Share your article on your own LinkedIn profile. That’s the basic step to start a chain reaction. 2. Share the LinkedIn article (not the page with the signup form) on every social account you have. 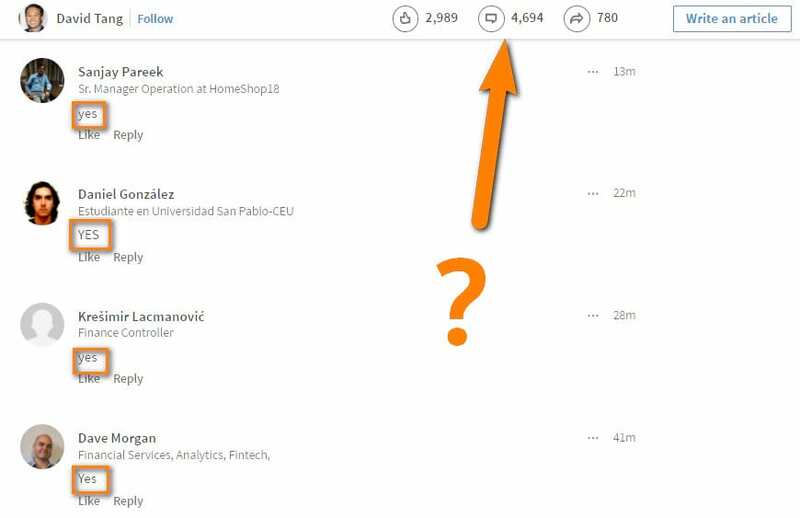 LinkedIn has analytics to show you where people came from to your article. At first, my visitors were coming from Facebook, and then switched to LinkedIn when the campaign was well under way. Monitor where your audience is coming from in the beginning, and double down on that channel. 3. Reply to the comments. There will be commenters wondering if this is a scam. Reply to them and let them know that you are really doing a free giveaway. 4. Email your existing subscribers. You might think it makes no sense to get email addresses from people who are already subscribed to you. But the virality of your campaign is not about emails, it’s about comments, likes, and, as a result — shares. Your email subscribers are the ones who already know you and trust you. They are more likely to help you spread the word. You can also invest some money in Facebook Ads to give your article an initial acceleration. Once your campaign turns into a viral loop, you will need to help your new subscribers. This was a discovery for me, but it turns out that even sending something as simple as a zipped folder will generate hundreds of emails asking for help. Preempt misunderstanding by telling people upfront how and when they will get their freebie files. Since you are sharing intellectual property, include a license into the .zip folder. Specify whether your files are free for personal and commercial use. Give specific instructions. For example, a few dozen people emailed me for help because the .zip file was not opening in PowerPoint. That’s when I updated my article to tell them in advance that have to unzip it first. The LinkedIn part of this campaign is free. However, someone has to send those confirmation emails and store the subscribers. There are great premium solutions for that, including Aweber, GetResponse, Ontraport, ConvertKit, and many other. But the free Constant Contact “New Business” account will also do before you get the first 2k subscribers (you’ll need a paid account beyond this point). You’ll just have to spend some time setting up a custom “Thank you for subscribing” page with a link to your freebie. Will this Growth Hack Work For You? People like free stuff. If you make a valuable thing and give it away for free, it will be hard to resist. So make something people really want. And make it good. Commenting spreads your post across LinkedIn. From your connections to connection’s connections. So if 100 people comment, considering that 55% of LinkedIn users have 500+ connections, your post will be visible in at least 50,000 feeds. Trust me, 76k subscribers is not a limit! Overall, the quality of leads I’m getting from LinkedIn is high. Yes, I’m still getting new email subscribers, although I published this article around a month and a half ago. With this viral loop I haven’t just built my email list. 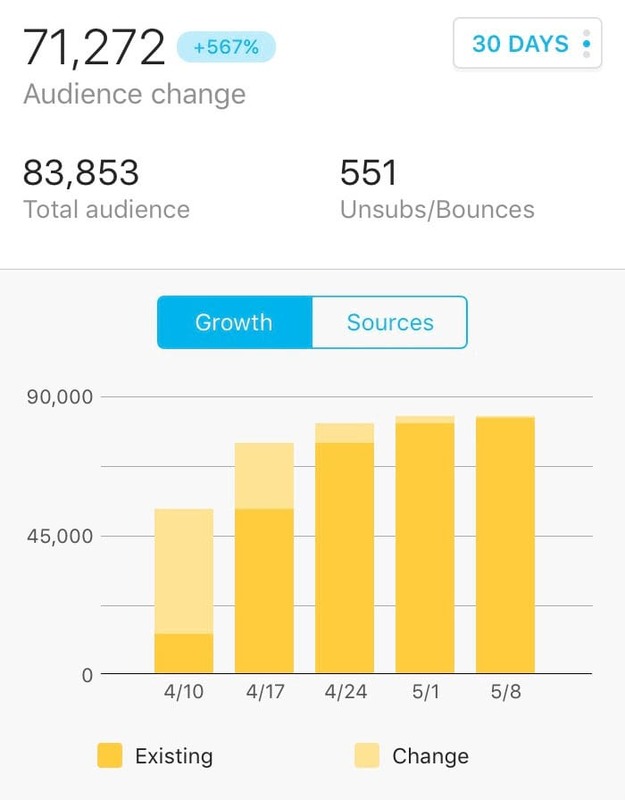 I’ve been also getting new leads through LinkedIn messages, and my connections grew from 6,000 to over 8,000. This campaign was so successful for me because I run an infographic maker company, and quite a few customers of mine use infographics in presentations. There is a direct connection between what I give away and what I sell. 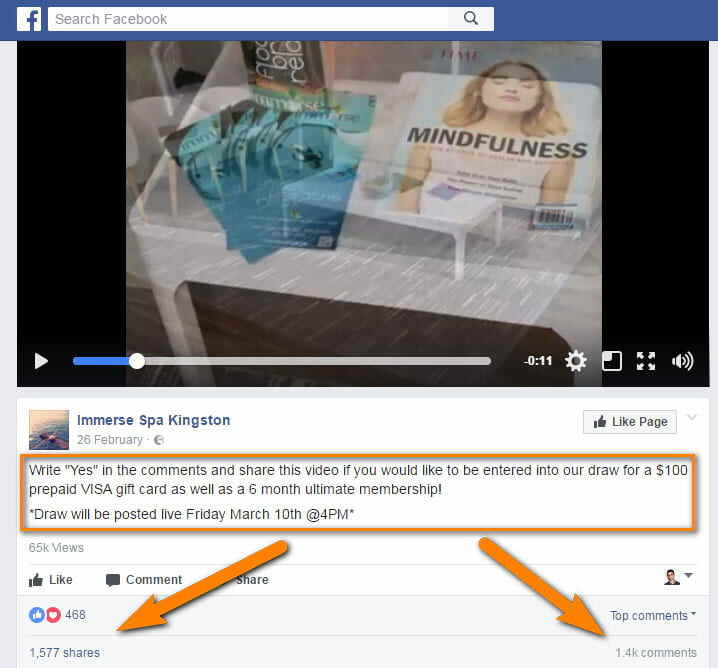 So when you design your campaign, think of how your giveaway relates to your niche. How do you like this growth hack? Do you think you could also make use of it? Or maybe you already did? Do let me know in comments!